High-performance outpatient center and outpatient surgery center will provide integrated care for patients, with reduced costs and higher productivity for the client, in Show Low, Ariz.
NexCore has enjoyed collaborating with the Summit Healthcare team on the space programming and development process, which will pay off in the form of an innovative and outstanding solution that we know will be an asset to the patients and providers throughout the region for many years to come. Guided by its innovative space planning process, NexCore Group is helping to bring more accessible, integrated healthcare to residents of the Show Low area, as well as increased productivity to the leading local provider. Summit Healthcare Auxiliary Building, one story, 54,699 square feet, housing administrative offices, community meeting rooms and materials management space. Denver-based NexCore Group, a national healthcare real estate (HRE) developer, is providing strategic planning and development services for the overall campus, and is handling financing, development, leasing, property management and asset management for the outpatient pavilion, which it will own. NexCore was engaged by Summit Healthcare, a health provider that draws patients from a radius of about 100 miles, to lead the development of a new outpatient campus. The system’s goals were to increase patient satisfaction and enhance the provider’s productivity by consolidating and coordinating nine primary and specialty care clinics spread across a wide geographic area. Using its innovative space planning process, NexCore’s in-house design team guided administrators, physicians and staff of Summit Healthcare and Summit Healthcare Medical Associates through a space transformation and consolidation effort to arrive at design solutions that will provide greater patient convenience while increasing physician capacity, streamlining workflows and improving efficiency. 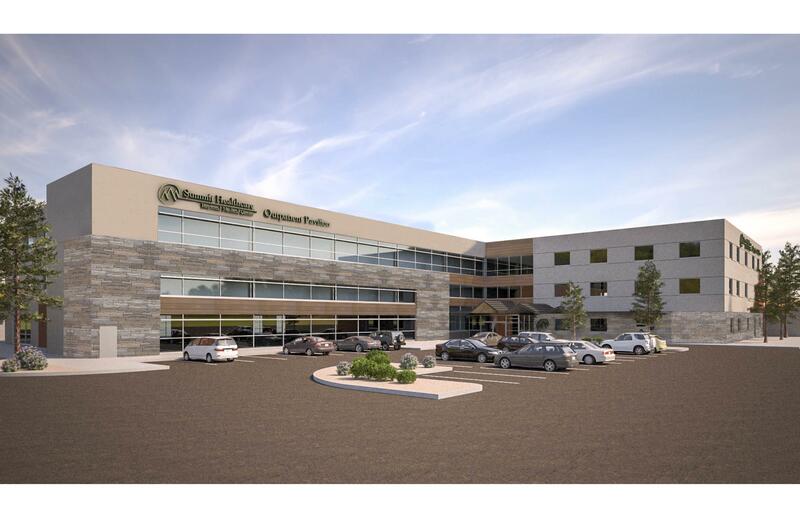 Initially, the project team envisioned an outpatient center totaling about 60,000 to 70,000 square feet. But as the feasibility process progressed, it became clear that a larger facility integrating a wider range of services would be a more farsighted solution. A larger project could not only serve current needs but also accommodate anticipated future growth with a minimum of additional investment. Todd Varney, Managing Principal, says NexCore is pleased to provide advanced solutions that result in the development of the most convenient, efficient and productive healthcare facilities possible in all types of settings, including this growing resort community in the mountains of Arizona. The process NexCore used to develop a plan for Summit Healthcare Outpatient Pavilion included several different components. First the team took a detailed look at the current provider throughput and platform utilization. The team then conducted time trials to get a sense for how many patients were being seen and how the current patient check-in system worked, as well as wait times and patient in-room times. Summit Healthcare’s Chief Medical Officer, Alan DeWitt, MD, says their team found the process to be invaluable. “NexCore has provided a tremendous resource in helping us analyze the current workflows in our various clinics and then improve upon those workflows and the design of our new integrated clinic. During NexCore’s planning process we focused on how patients experience care in our clinics from check-in to exam to scheduling procedures. We also looked at elements of the provider workflow like what percentage of time an exam room is filled, how often the provider is there to see patients, and so on. Frankly, we did not have this kind of expertise in house, and so it’s been fantastic to have NexCore’s guidance and leadership as we make critical decisions about the new clinic,” Dr. DeWitt says. In addition to conducting feasibility studies and answering questions, NexCore organized tours of facilities at other health systems to explore various workspace and workflow options, and went beyond blueprints and plans by building a life-size mock-up that allowed Summit Healthcare’s providers to visualize and experience those proposed workflows. Along with the increased satisfaction and convenience to patients, the new platform is anticipated to increase physician capacity by 20 percent while delivering a 10 percent cost reduction. “I had never heard of anyone doing a full-scale mock-up of an entire clinical pod, but with the mock-up height, the substance of the walls, and details in the exam rooms and provider workspace, you can really envision what the actual clinic is going to look like and how it will perform. Touring the mockup has been very reassuring for our physicians,” explains Dr. DeWitt. As the project progressed, the development team also realized that it would provide greater flexibility if the new Outpatient Surgery Center was built as a separate, freestanding structure because that would allow for future expansion. The Surgery Center will, however, be connected to the Outpatient Pavilion for added convenience. The Auxiliary Building will house non-clinical services that are currently located in the adjacent hospital, and will support the entire campus. The space vacated by the relocation of these functions will allow for expansion of inpatient services within Summit Regional Medical Center. Plans call for all three buildings to be completed near the end of 2018. The new Summit Healthcare outpatient campus will provide primary and specialty care, imaging, physical and occupational therapy, sleep lab, pharmacy and ambulatory surgery services. In addition to providing many benefits to the citizens of Show Low, the first-class outpatient campus will also be an asset when it comes to recruiting physicians and staff. Additionally, Summit Healthcare will be able to compete more effectively with specialty providers in Phoenix by offering comparable services in Show Low. Jessica McGinnis, Summit Healthcare’s Director of Practice Management, says the new facilities are a win-win for the community. “I’m 100 percent sold that this new integrated clinic is going to be a wonderful thing for our patients. It’s going to give them the appropriate care at the appropriate time at the appropriate location, and it’s going to bring our team members together under one roof to work together as a unit,” she says. The Summit Healthcare Outpatient Pavilion will be occupied by Summit Healthcare outpatient services, over 60 Summit Healthcare physicians, 65 the NEAR Care Team members, and affiliated independent physicians. Space is still available on the second and third floors of the Outpatient Pavilion to lease to independent physicians. For more information on leasing, please contact Stacey Hall, Vice President, Leasing at (928) 288-5354 or stacey.hall(at)nexcoregroup(dot)com. NexCore Group develops healthcare facilities for hospitals, health systems and physicians. We solve complex real estate challenges through innovative building solutions and creative financial structures. In a rapidly changing healthcare industry, NexCore has the superior expertise to deliver quality environments and flexible spaces that help grow your business, lower expenses and mitigate risk. Over the past 25 years, NexCore has developed and acquired a total of 7.1 million square feet of health care facilities across the country. Our company has been recognized repeatedly as one of the Top Healthcare Real Estate Developers in the U.S. by Modern Healthcare magazine. NexCore is headquartered in Denver and, as the company continues to grow, so does its geographic reach. During the past several years, NexCore has opened regional offices in Chicago; Bethesda, Md. ; Portland, Ore.; Dallas; Orlando, Florida; Laguna Niguel, Calif.; and Indianapolis. For more information, please visit http://www.nexcoregroup.com. Contact: Tracy Hindman, Marketing Director, 303-293-0673. Location: Addresses for the Outpatient Pavilion, Outpatient Surgery and Auxiliary Building have not yet been assigned. Size: Outpatient Pavilion: three stories, 103,866 square feet (gross); Outpatient Surgery: one story, 16,213 square feet (gross); Auxiliary Building: one story, 54,699 square feet (gross). The three buildings are on an 18.81-acre site that directly abuts Summit Healthcare Regional Medical Center. Lender: Outpatient Pavilion: Siemens Financial Services Inc. Owner: Outpatient Pavilion: NexCore Group LLC, Denver; Outpatient Surgery and Auxiliary Building: Summit Healthcare, Show Low.